Preheat the oven to to 180°C, gas mark 4. Butter a 12-cup muffin tin (use one with cups measuring 7cm in diameter and 4cm deep). Beat the butter and sugar together until light and fluffy. Gradually add the egg, with a spoonful of flour at each addition. Sift the remaining flour and cocoa together, add the pinch of salt and fold into the mixture with a large metal spoon. Use to fill the muffin cups and bake for 15-20 minutes or until cooked through. After 5 minutes cooling in the tin, turn the cakes out on to a cooling rack and leave to cool completely. To serve, slice the cakes in half horizontally. Place a dollop of whipped cream on the base, add a generous spoonful of black cherry conserve and top with the remaining cake half. Don't worry if the filling oozes out a little - this makes the cakes look even more delectable. 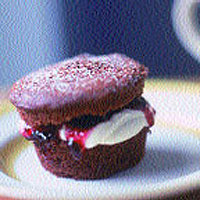 Lightly dredge a mixture of icing sugar and cocoa powder over the cakes and serve with afternoon tea.